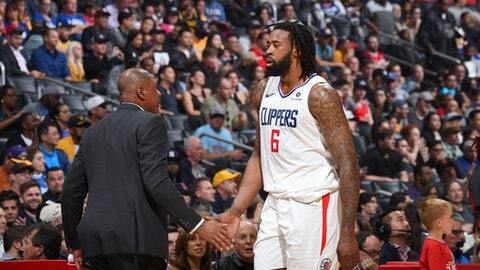 DALLAS (AP) The Dallas Mavericks are making another run at DeAndre Jordan, three years after the center jilted them in free agency to stay with the Los Angeles Clippers. Jordan has opted out of the final year of that contract he signed with LA in 2015, and the Mavericks intend to pursue him as an unrestricted free agent, a person with knowledge of the decision told The Associated Press on Friday. Dallas also intends to decline the $5 million club option on Dirk Nowitzki’s contract and re-sign him once its salary structure is more settled, the person told the AP on condition of anonymity because the sides are not publicly commenting on moves ahead of free agency opening Sunday. The move on Nowitzki is designed to create more room under the salary cap, as were the decisions to rescind qualifying offers to shooting guard Doug McDermott and center Salah Mejri, making both unrestricted free agents. Jordan was set to make $24.1 million under the four-year, $87.6 million contract he signed to stay with the team that drafted him in 2008. Seven years later, the Mavericks made a strong play for Jordan, who agreed to sign with them as a free agent. The Houston native changed his mind, and the saga played out on social media the day before Jordan could sign. Former teammate Blake Griffin and coach Doc Rivers were part of a contingent that went to his house and stayed with him until the deal was official. The reversal was a stunning setback for Dallas, which made the playoffs without Jordan the following year but lost in the first round and now is coming off consecutive losing seasons for the first time in nearly 20 years. Circumstances are much different now, with the former All-Stars who helped persuade Jordan to stay no longer around. Chris Paul engineered a trade to Houston last summer, and the Clippers shipped Griffin to Detroit in January in a sign that rebuilding years could be ahead. The Mavericks are two years into their own reconstruction, with 2017 first-round pick Dennis Smith Jr. joined by another player who will begin his NBA career as a teenager in European standout Luka Doncic. Dallas moved up two spots in the draft last week to get the Slovenian guard, who was taken third overall by Atlanta while the Mavericks selected former Oklahoma scoring sensation Trae Young for the Hawks. Mavericks owner Mark Cuban refused to accept an apology from Jordan after the reversal, but later said he was moving on and never ruled out acquiring a player despite what was seen as a betrayal. Now the billionaire wants to get the Mavericks back to winning as soon as possible. Cuban was fined $600,000 last season for public comments admitting the club tanked for better draft picks, but his point was that he was telling his players he wanted to get away from that strategy. A long-term deal for Jordan, who turns 30 in July, would be a strong sign of that. Jordan, who was second in the NBA at 15.2 rebounds per game last season, shores up an area that has long been a weakness for a franchise that hasn’t won a playoff series since winning its first NBA title in 2011. He averaged 12 points per game last season. His arrival would be an odd twist for Dallas fans, who booed him steadfastly in each of his five trips to Dallas after that summertime saga. Jordan’s presence also could mean Nowitzki comes off the bench in what is expected to be his record 21st season with the same franchise. Since the change of heart by Jordan, the most productive center for the Mavericks was their immediate replacement – Zaza Pachulia in 2015-16. Dallas hoped Nerlens Noel could become a significant piece after trading for him at the deadline in 2017. But the sixth overall pick by Philadelphia in 2013 never blossomed.